A woman works at home while her children play. She has a diaper sewing business. The invention of the computer, fax machine, internet, and e-mail has made working at home a common practice for millions of Americans. 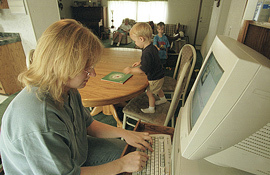 About 80 percent of those who work at home use a computer for their work and about 60 percent use the internet or e-mail in working at home. A 2001 survey found that in May of that year almost 20 million Americans worked at home at least one day a week. About a third are self-employed. The same survey found that most workers who did job-related work at home did so without being paid for it. Managers and professionals are more likely to bring work home to catch up with the backlog at the office or to focus on work in a quieter environment. Click on CHART for more information.